The value of a United Nations Anniversary, 25 - 10 cents 1970 stamp depends on several factors such as quality and wear, supply and demand, rarity, finish and more. Values in the section are based on the market, trends, auctions and recognized books, publications and catalogs. This section also includes information on errors and varieties and characteristics. As a Charter member dedicated to international peace, security, the development of friendly relations between nations and the achievement of a spirit of world cooperation, Canada joins with fellow member-countries celebrated the 25th Anniversary of the United Nations for which Peace and Progress has been selected as the theme. It has been said that the concept of the United Nations sprang from the Atlantic Charter, drafted by President Roosevelt of the United States of America and Prime Minister Winston Churchill of Great Britain, and issued on the August 14, 1941. This famous Charter speaks of the need to establish a permanent system of general security, the abandonment of the use of force and a desire to bring about the fullest collaboration between all nations in the economic field. At the beginning of 1942, in a world still torn by war, Canada was one of 26 nations subscribing to these purposes in the Declaration of the United Nations. Representatives of four of the world's great powers, meeting in Moscow in October 1943, recognized the necessity of establishing at the earliest possible date a general international organization, based in the sovereign equality of all peaceloving states, and open to membership of all such states, large and small for the maintenance of international peace and security. The Dumbarton Oaks conversations, extending from August to October 1944, laid the foundation for a wider Conference, convened in San Francisco in April 1945, which was attended by 50 sovereign states. Many weeks of searching deliberations culminated on the 26th June in the unanimous adoption and signing of the Charter which came into force on the 24th October 1945. At the opening of the San Fransisco Conference, Canada's Prime Minister, after emphasizing his delegation's preoccupation with the creation of a strong and flexible organization, added, in Part: Experience has shown that the contribution of smaller powers is not a negligible one, either to the preserving of peace or to its restoration when peace has been disturbed. 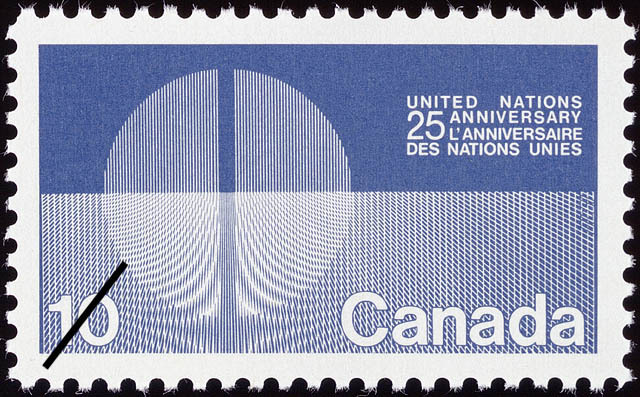 In creating a design for the Canadian United Nations 25th Anniversary stamps, the artist symbolically represents a sense of emergence and illustrates the tremendous force and energy being focused towards a unification of the world.